Aerocool introduces the GT-S, a new supertower case for gamers and computer enthusiasts. 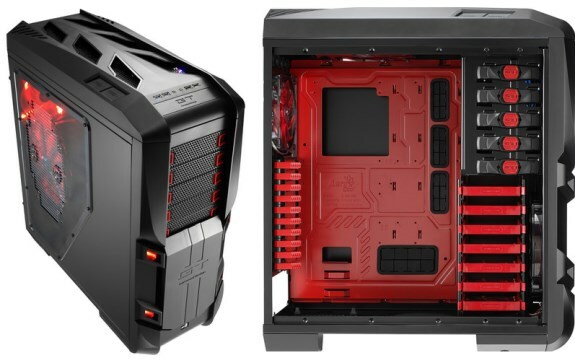 Aerocool Advanced Technologies, one of world's leading manufacturers of excellent gaming PC gear, is officially announcing the first PC chassis of the GT series. The GT-S Super-Tower aims for Gamers and power users, who are looking for a chassis with vast space for latest gears, excellent features and remarkable design. Aerocool designed the GT-S chassis to surpass common standards and push it a bit further! Mainframe of the chassis is made of especially robust 1,2 mm thick SEEC steel, to provide excellent stability. Furthermore, due to the overall dimensions of 255 x 640 x 560 mm (WxHxD), Aerocool considered to call the GT-S a Super-Tower. Users, who are not willing to make compromises, will especially like the new chassis! Various features are implemented on the outside, such as the built-in fan controller for up to seven fans, cooling optimized airflow outlets on top-panel as well as a magnetic front cover, which can be moved variably or even removed completely. It is available as a black version with red illuminated case fans and white version with blue illuminated case fans. It surprises with a futuristic design on the outside, and superb space for high-end components on the inside. Thanks to the built-in window in the side-panel, a great view on the built-in hardware is guaranteed. On the inside, more than enough space for latest hardware is assured. Aerocool GT-S Super-Tower supports even the XL-ATX form factor, besides the common form factors such as FLEX ATX, Micro ATX, ATX, MINI ATX, SSI CEB, SSI EEB (EATX). VGA cards with a width of up to 33,3 cm and CPU coolers with a total height of up to 18,5 cm can be mounted easily inside as well. To ease the installation process, GT-S cases are equipped with an opening for backplate based CPU coolers and several openings for cable management, which are outfitted with rubber protections. In addition, one removable dust filter is pre-installed beneath the PSU location area, to stop dust from getting inside the chassis. For users with watercooling systems, four pre-drilled openings with rubber protection are located on the rear side of the GT-S Super-Tower. Users are able to conveniently mount up to seven 3,5 or 2,5 inch drives into the HDD trays and access the five vacant 5,25 inch bays to mount optical drives or additional accessories. Both the bays and the HDD trays are equipped with a tool-free mounting system, to assure easy installation procedure and safe mounting of the drives. To provide sufficient cooling, three case fans are supplied and already built in. First 200 mm case fan is located in the front panel and the second in the top-panel. Both fans are silently spinning at 750 RPM (90,25 CFM, 27,6 dBA). Third fan is a 140 mm model, which is located in the rear of the GT-S chassis and operates with 1.200 RPM (49,10 CFM, 24,2 dBA). All three fans can be connected to the built-in fan controller, to adjust fan speed to the optimum. Furthermore, additional case fans can be mounted and connected to the fan controller, to optimize the airflow inside the chassis. Fan speed can be adjusted by pressing the allocated (Speed + and Speed -) buttons on the left side of the top-panel. In the center of the top panel, users are able to access the nicely implemented I/O panel, which includes two USB 2.0 and two USB 3.0 ports, HD-Audio and Mic-in. Power and reset button as well as the LEDs are located on the right side, blending in perfectly into the futuristic overall design. Aerocool GT-S Super-Tower is available as of today. Manufacturer's suggested retail price for the GT-S Black Edition is set at 114,90 EUR and for GT-S White Edition at 119,90 EUR (excl. Taxes).